Bergman with a “caveman steak” from Longhorn Meat Company and a 7-ounce lobster tail. PLACER COUNTY, CA (MPG) - Mayor Bridget Powers along with 100 Solstice Senior Living at Auburn residents, family members and staff came together on June 19 to celebrate resident Roy Bergman’s 100th birthday. Bergman is a World War II veteran and has been a resident at the senior living community for more than five years. After a 30-year career with San Bernardino County Fire, Bergman retired as a captain. 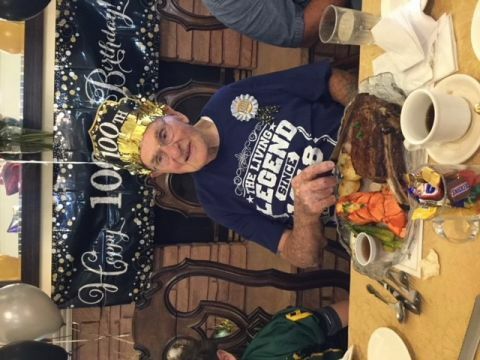 In honor of Bergman’s 100th birthday, local family-owned butcher shop Longhorn Meat Company donated lunch – over 30 pounds of meat – for the event. Local band 6 String Daisy also provided live entertainment for the community event. Solstice Senior Living at Auburn is located at 3250 Blue Oaks Drive, Auburn, CA 95602. Visit www.solsticeatauburn.com for more information.